Whilst in the afternoons Pujya Bhaishri is narrating Bhagavat Katha, devotees are making the most of their time at Prayag in Kumbh also listening to Ram Katha by Pujya Bhaishri in the mornings. 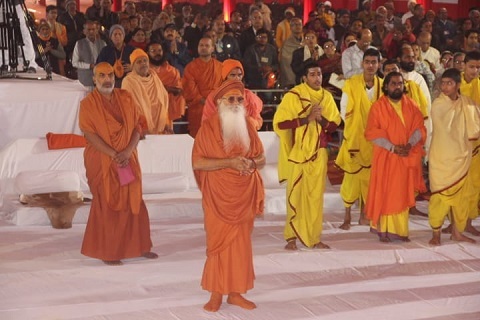 Along with this, the darshan and satsang with divine saints is a unique blessing. For those who cannot be physically present in these divine moments of Kumbh, let us join the Ram Katha via the live telecast on Sanskar TV of the plus the summaries below for the past three days. 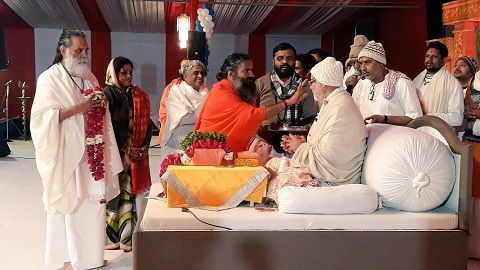 On day 1, Shri Ram Katha by Pujya Bhaishri began in the presence of divine saints, Pujya Maharajji (Guru Sharananandji Maharaj), Pujya Gitamanishi Gnananand ji, Pujya Swami Govinddev Giri ji, Jain Muni Lokeshmuniji and other saints. 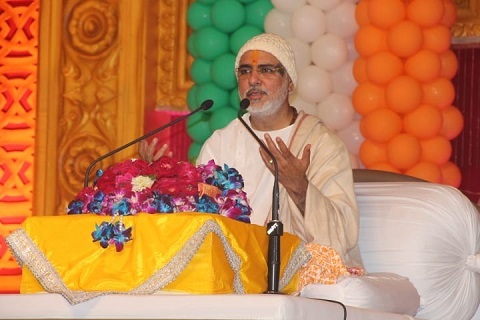 Pujya Bhaishri said that a person’s mind cannot remain vacant. It is always thinking of the good and bad. If it does not think of God, it will think of material things. Thinking of God liberates one from attachments and makes the mind pure. Prolonged thinking of enjoying material pleasures increases the desires for them. On not attaining these desires, the mind becomes restless and distressed. Continuous enjoyment of material pleasures makes the intellect inanimate. Consequently, good resolution or good thoughts cannot rise in an inanimate intellect. A human first thinks then plans the actions accordingly. The hand, legs and senses get ready to work on the resolution made. Thus, both good and bad deeds can be carried out. To make life blissful, it is important that the mind is concentrated as much as possible on good books, good company such as of sages and saints and the truth. This way, the mind will not get the opportunity to get to the wrong path. 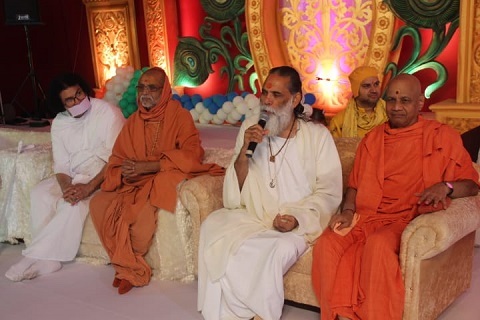 On day 2, Pujya Bhaishri attended the Yoga Shivir of Shri Ramdevji who also attended the Ram Katha in the morning. 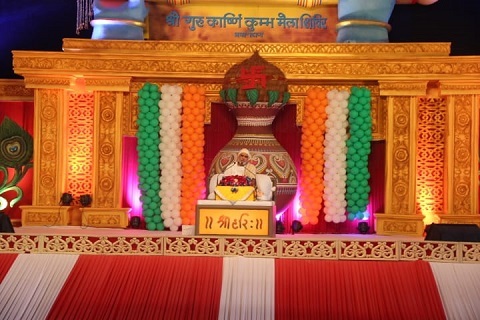 Pujya Bhaishri shared his thoughts on our nature and being in despair. Water will always revert to its cool state even upon heating it many times. Similarly, we will have to revert to the states of comprehension, fearlessness and happiness from anger, fear and restlessness as the former are our true nature. God has given us so much energy that we can become the means to not only our welfare, but also thousands of others. It is necessary we realise this strength in us and our true nature. The biggest obstacle in the journey of life is despair. When in despair, we let the situation dominate over us by accepting defeat quickly. Getting discouraged and dismayed due to a particular company and being influenced by what others have said is due to circumstances, whereas bliss, happiness, enthusiasm and virtuousness is our only true nature.